Dynamite’s own Gold Executive Director, Dr. Regan Golob, is a lifelong horseman who grew up on a cattle ranch in the Yakima Valley of Washington state. 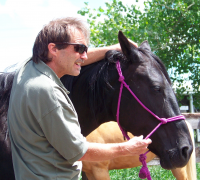 His horse experience includes working ranch horses and breeding and training race horses. He currently owns thoroughbreds and warmbloods for pleasure and fox hunting. After being paralyzed by a pinched spinal cord while playing high school sports, he was introduced to chiropractic. He was assisted back to total health, an experience which led him to pursue a life-long dream of being a healer. Regan received a Bachelors degree in Biology from St. Ambrose College in Davenport, Iowa. He received his Doctorate from Palmer College of Chiropractic in 1980. Dr. Golob has since received extensive training in Acupuncture, Cranial Sacral Therapy, Herbology with Dr. Christopher, and Nutrition with Dr. M. Ted Morter, Jr. Although holding degrees in both Biology and Chiropractic, Dr. Golob is noted for vastly expanding his knowledge beyond the confines of any single discipline. He integrates his knowledge of the healthy functioning of all aspects of humans, animals, micro-organisms and plants to guide and nurture people and animals to optimum health. Dr. Golob does not treat illness and disease. Instead, he aids in awareness and enhancement of total health. Through his guidance, people become capable of replacing illness and disease with excellent health through learning to make better choices. Central to Dr. Golob’s abilities to guide humans and animals to a level of health that they may never before have experienced is knowledge of common sense physiology combined with development of Bio-energy analysis techniques, all of which reveal nutritional, structural and emotional imbalances. Dr. Golob often travels far from his home area to lecture and teach people to care for themselves. Attending classes given by Dr. Golob or participating in his health cruises are excellent investments in personal well-being.